For a lack of a better term, Dwayne "The Rock" Johnson is franchise viagra. He was the highest grossing actor of the year, and he has taken struggling series like Fast and The Furious, and G.I. Joe and made them a lot of money. So it was no surprise that rumored meetings between the bulky actor and executives from DC and Legendary pictures had become talked about among DC fans. Then the actor confirmed he would be working on a yet to be announced role with DC in 2014. Now on his instagram page the actor posted a picture with the hashtag #JohnStewartCanStillWhupSupermansAss. The only DC movie filming this year is Batman vs. Superman which would allow us to assume that Johnson will be making his comic book debut in DC crossover flick. Not only that but the hashtag is a refference to Green Lantern John Stewart who was at one point rumored for Denzel Washington. The Rock being added to this movie could be an interesting move for a film and series with a huge number of question marks. As I said in my previous post, DC knows this movie needs to do very well to move forward and not only that but it needs to start getting traction with the fan base. 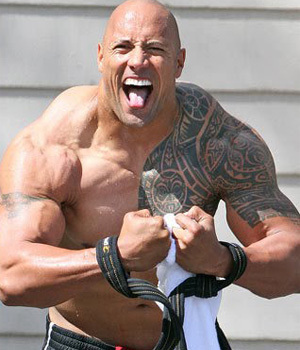 Adding The Rock could be a step in the right direction as long as Johnson doesn't show up to set looking like the Hulk. The only complaint people would have at first glance is that Stewart and Johnson have different body types which would make it paramount for the peoples champ to drop some of the muscles in order to look the part. Johnson is bigger then Superman Henry Cavill and would be more muscular then the Man of Steel. Johnson will appear as Hercules this summer, and filmed a film on HBO called Ballers with director Peter Berg.